Samford University’s Howard College of Arts and Sciences held its 2014 commencement ceremony May 17, awarding more than 200 undergraduate and graduate degrees. Samford President Andrew Westmoreland and Howard College of Arts and Sciences Dean David Chapman presided at the ceremony. Judson College president David E. Potts delivered the college’s commencement address, emphasizing the close historical ties between the institutions. Samford was founded as Howard College in Marion, Ala., shortly after the founding of the Baptist women’s college. Potts himself has a long history with Samford. He holds bachelor of arts and masters of science degrees from Samford, and was surprised at the commencement ceremony with an honorary doctorate from his Alma Mater. 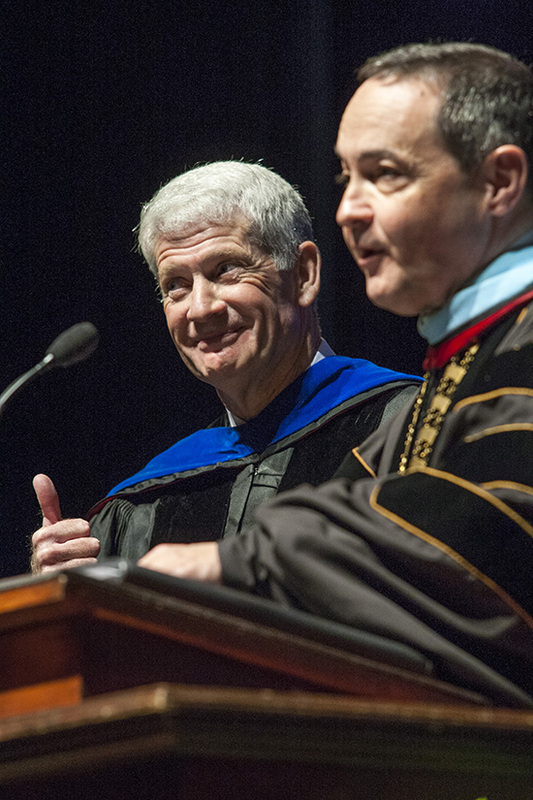 Westmoreland, Samford provost Brad Creed and board of trustees chairman Bill Stevens presented the Doctor of Humane Letters honoris causa in recognition of Potts’ accomplishments and service. In addition to his study at Samford, Potts worked at the university for many years, starting as an admissions counselor in 1972 and rising to become director of financial aid. He served as Vice President for Development at Judson from 1980-1984, then returned to Samford as assistant to the president, organizing and implementing a capital campaign. In 1987 he returned to Judson as executive vice president for administration and vice president for development. He became Judson’s president in 1990. Potts has long been actively engaged with the problems of poverty in Alabama, serving on the Governor’s Black Belt Action Commission and with the Sowing Seeds of Hope and Alabama Poverty Project nonprofit organizations. In his address–An Education for Transcendent Living–he emphasized the spirit of Christian service that created Samford and Judson and continues to find expression in the work of students, faculty and staff. Potts noted that the name of Howard College of Arts and Sciences honors the English prison reformer and philanthropist John Howard. That might seem a strange choice for an antebellum Alabama college, but Potts invited his audience to consider the lives of Edwin Davis King and Julia Tarrant Barron. General King came to Alabama as a veteran officer of the War of 1812 and became one of the state’s wealthiest men. “King holds a place of true distinction by having served simultaneously as the President of the Board of Trustees of the University of Alabama, the Chairman of the Board of Trustees of Judson College and the President of the Board of Trustees of Howard College,” Potts said. Barron wed a wealthy Marion businessman and was widowed soon after. “For almost four decades, Mrs. Barron found herself among the few independent businesswomen in the state of Alabama,” Potts said. Bankrupt after the Civil War, she reflected on her previous philanthropy and regretted only that she had not given more. “While you and I may not establish a college or university (although you should,) or organize a mission board (although you could,) or publish a religious newspaper, our transformation of heart and spirit impels us to live transcendently,” Potts said. As an example, he pointed to the annual Old Howard 100 bike ride through the Black Belt, sponsored by Howard College of Arts and Sciences. The ride celebrated its tenth anniversary in April with record participation and a ten-year total contribution of more than $35,000 for the Sowing Seeds of Hope organization in the Black Belt. Potts said that initiative and many other partnerships between Samford and Judson are making a difference in the counties where more than half the children and almost half of the elderly live in poverty. Other highlights of the arts and sciences commencement ceremonies included farewell addresses by SGA president Cameron Thomas and senior class president Jake Hamilton, and presentation of the university’s Velma Wright Irons salutatorian award to Anna Grace Poole, a psychology major and University Fellow honors student from Arkadelphia, Ark.